Students take a "gallery walk" of Norman Rockwell paintings, discuss the stories the painter was trying to tell through his paintings. become familiar with the American master painter Norman Rockwell. work cooperatively with peers in a "gallery walk" setting to describe the scenes that Rockwell painted. think critically about/interpret the stories Rockwell was trying to tell through his paintings. Gather slips of paper, one per student. Divide the slips into four groups of roughly equal number. Write the word Setting on each slip in one group. Write Characters on each slip in the second group. Write Event on the third group of slips. Write Vocabulary on the slips in the fourth group. Print copies of these two Rockwell paintings. The images below might be printed for use in your classroom discussion. Click on the small image at the top of each Google Images page for a full-size image to print. In addition, gather four sheets of chart paper or poster board. 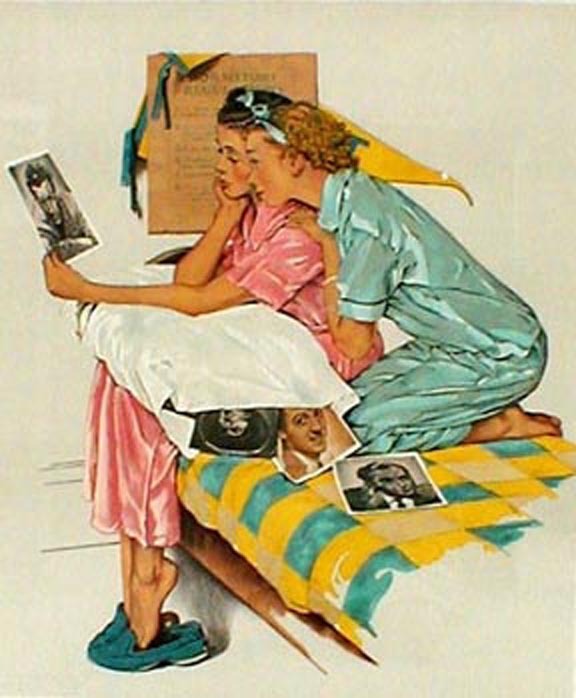 Attach to each sheet a copy of a different painting by Norman Rockwell. These four paintings might be good ones to use for this activity (or see the sidebar for additional ideas). Attach each image to one of the four sheets or chart paper or poster board. Divide the remaining space on the paper/poster into four equal areas labeled with one of the four headings: Setting, Characters, Event, and Vocabulary. Finally, print out copies of some or all of the images in the sidebar. the setting of the painting (for example, a bedroom, an attic, in front of a mirror). Write student responses in the block labeled Setting. the characters in the painting (for example, a girl, a movie star in a magazine, a model). Write student responses in the block labeled Characters. the event or situation in the painting (for example, girl trying to strike a facial pose similar to the movie stars pose in the magazine, a girl who has combed her hair to mimic the style on a movie stars hair, a girl who is torn between being a child who plays with dolls and a grownup). Write student responses in the block labeled Event. things or feelings depicted in the painting (for example, pout, pose, movie star, hairstyle, magazine, makeup, growing up, expression, mimic, imitate). Write student responses in the block labeled Vocabulary. You might take extra time to encourage students to write as many descriptive words as they can to fill the Vocabulary block. When you have completed this activity, invite one or two students to tell about the story Rockwell was trying to capture in this painting. Students might draw from the list of terms written on the chart as they describe the painting. Repeat the procedure above with another of Rockwells paintings, for example, Waiting for the Vet. Invite students to share words or phrases that describe the Setting, Characters, Events, and Vocabulary of this Rockwell painting. 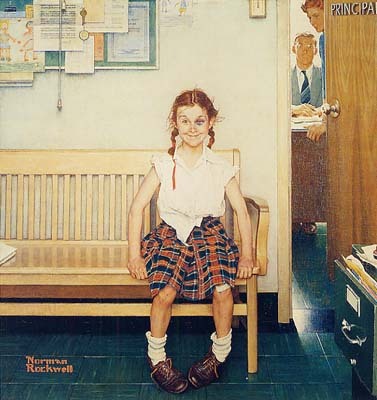 Then invite one or two students to share the story of what Rockwell tried to capture in "Waiting for the Vet." You might also talk about the "time period" when Rockwell was creating these paintings. Give students an opportunity to talk about how times have changed. They might draw parallels between the innocent times depicted in Rockwells paintings and some of the TV shows they might know from that era -- shows like Leave It to Beaver. Norman Rockwell captured the heart and soul of America in his "Four Freedoms" paintings. You might share these paintings with your students. Challenge students to describe the Setting, Characters, Event, and Vocabulary of each of Rockwells four "Four Freedoms" paintings. Next, arrange students into four groups. Fan out the cards or slips of paper on which you have written one of the words Setting, Characters, Events, and Vocabulary. Invite each student to choose a slip. Students will gather in groups according to the slips drawn. (For example, all students holding a slip labeled Setting will gather in one group, and so on.) Introduce students to four more paintings by Norman Rockwell. When five minutes have passed, each group will rotate to the next chart/poster and fill in their block Continue rotating students at five-minute intervals until each group has visited and filled in their assigned block on each paintings paper/poster. When the "gallery walk" is completed, bring the groups back together. Share what the groups have written and invite other students in the class to add to the words and phrases to each block on the charts/posters. 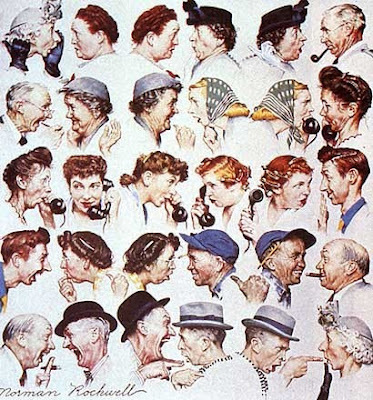 Finally, provide copies of some other Rockwell paintings (see first sidebar). Ask each student to create a 4-block graphic organizer; they will fill in each block -- Setting, Characters, Event, and Vocabulary -- with words or phrases that come to mind. When they have completed the graphic organizer, they will use the information in it to write a paragraph or short essay that shares their ideas about the story that Norman Rockwell was trying to tell through the painting.